Have you ever noticed how plain your kitchen walls are looking and thought about calling someone in to give you a quote for a kitchen backsplash to add a little flair? Add beautiful accents to the existing décor inside your kitchen when you choose any one of our tile, stone, or marble kitchen backsplashes in Vernon, CT. No matter what type of tile backsplashes you want us to install in your kitchen, at Schneider’s Flooring America we can match your existing style perfectly. From classic marble backsplashes that radiate elegance to more rugged stone look for your backsplash, we deliver an unbeatable combination of strength and beauty that will last for the entire life of your kitchen. You can paint the walls any color you wish, but nothing adds a more stylish personal touch than a backsplash design with unique tiles. Customers from all over the Vernon area know that they can place their trust in our backsplash installation crew to add something special to their home. Invite our skilled and experienced team into your kitchen and see the difference that our installation experience can make in your home. Ease of Cleaning: Provides a practical solution to keep the messiest rooms in the house one of the easiest to clean. Protection: Help protect wallpaper and painted walls from the splatter of cooking. Kitchen backsplashes by your stove will help to prevent odors from absorbing into your walls. Aesthetics: Tile, stone, or marble backsplashes add a focal point to an otherwise dull looking kitchen. Enhance your room with some flair without being extravagant or overspending while providing a more aesthetically pleasing kitchen overall. Structural: Backsplash installations are a great way to hide small gaps that can be unsightly when countertops don’t sit flush. Let’s face it, the wall behind your sink and stove are always decorated with unwanted foods and liquids. We all know that no matter how hard we scrub there is no way to get spaghetti sauce stains off painted walls. What you’ll love about kitchen backsplashes in Vernon, CT, is the fact that they make cleaning so much easier. In most cases, all you have to do is wipe down the backsplash with a damp cloth or sponge, and the task is done. No matter what type of tile backsplashes you desire for your kitchen, we can help you pick the perfect match for your interior design décor, lifestyle, and budget. Available in a wide range of colors, styles, patterns, and materials, our kitchen backsplashes in Vernon, CT, from our flooring store are precisely what you need to bring out the best in your kitchen. At Schneider’s Flooring America, our backsplashes are made from marble, stone, or tile are all available for you to check out in person at our flooring store. Visit us today, and you can browse through the different examples that we have on display in our spacious showroom. 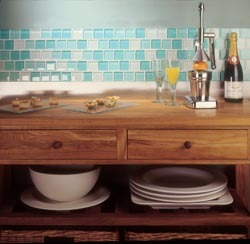 Incorporate color into your kitchen with a colorful backsplash. Our wide variety of tile is available in an array of colors. You should not have any trouble finding a tile color that fits in with your kitchen’s color scheme. You can touch and feel the actual tile, and see how they look in our mock kitchen settings, so you know exactly how they will perform at your home. In addition, our friendly and knowledgeable staff is always on hand to answer any questions you might have about our stone, marble, and tile backsplashes. At our flooring superstore, we are in the business of improving the look, feel, and function of your home. We offer a large variety of backsplashes made from quality stone and marble at several price points. Once you have purchased your marble or another tile of your choice for your kitchen backsplashes from our sales team, you can schedule an appointment with our skilled backsplash installation team. We will work around your busy schedule, so you don’t have to wait around for your new kitchen backsplashes. Your time is valuable, so we make sure to have as little of an impact on your daily home routine as possible when we install your stone or marble backsplashes. Let us become your go-to source when you are considering any kind of kitchen backsplashes. With an endless array of colorful and textured tiles to choose from let your imagination and creativity be your guide and as you design a one of a kind kitchen backsplash that’s truly characteristic of your taste and style. Contact today at Schneider’s Flooring America for more information on all of our products we offer to enhance your home. We proudly serve Vernon, CT, and the surrounding areas.